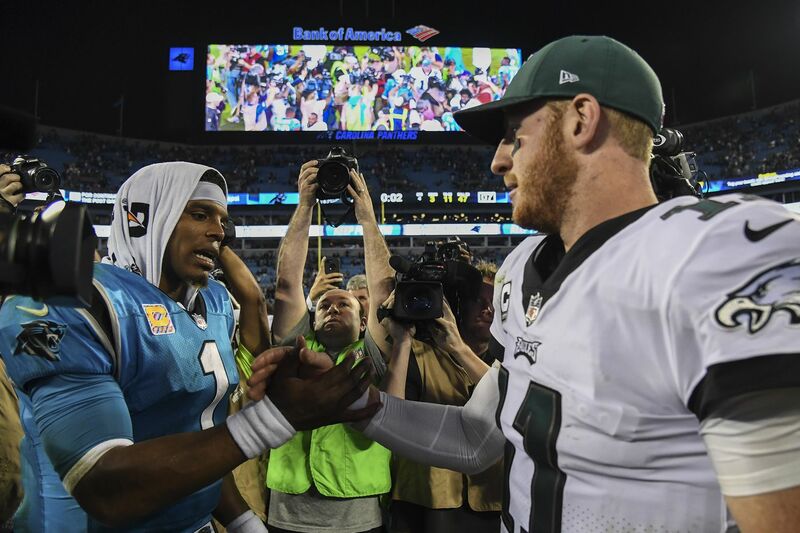 Carson Wentz and the Eagles legitimized their Super Bowl aspirations last season to many observers when they beat Cam Newton’s Carolina Panthers in Charlotte in Week 6. The Eagles have fared pretty well against Cam Newton over the years. He is 2-2 against them, but has thrown nine interceptions in the last three meetings. The Eagles losses came in 2012, when the team was en route to a 4-12 season and the firing of Andy Reid, and in 2015, when the team was falling apart in the final season of Chip Kelly. So when the Eagles haven't been playing for a coach who was about to be dismissed, they've won. This team's injuries give me pause. If Jason Peters and Lane Johnson are ineffective, or can't get through the afternoon, that could change everything. But we know the Eagles are a good team at home. So are the Panthers – they're 3-0 in Charlotte, 0-2 on the road. If Peters and Johnson can play reasonably well, I don't see Carolina's weapons creating the kind of big play trouble that has plagued the Eagles' defense. Yeah, Christian McCaffrey is a tricky little catalyst. And it would be just the Eagles' luck for Torrey Smith to have a big day against them, highlighting what they've been missing with him gone. But Carson Wentz is rounding into form, and I'm going to make a rare journey into the land of Eagles optimism. I haven't traveled there lately, I hope my passport remains valid. Even with the people they are missing on the back end, I'm not as concerned about the potential damage Cam Newton can do to them as a passer as I am the damage he can do to them as a runner, particularly if the Panthers are able get into to a lot of third-and-shorts. Cam already has 20 rushing first downs, which is the most in the league by a quarterback and the ninth most by a player at any position. If they can neutralize the Panthers on first and second down and put Newton in a lot of third-and-longs, the Eagles will win. Just like they did last year when Newton threw three third-down interceptions against them, including two that set up short touchdown drives. The Panthers have converted just 21.9 percent of their third downs of six yards or more, which is the sixth lowest percentage in the league. Newton has a 20.4 passer rating on third-and-six or more. That's what the game's going to come down to. How many third-and-longs the Eagles defense can put Cam in. The Eagles legitimized their 2017 aspirations, to many, when they traveled down to Charlotte on a Thursday night and beat a good Carolina team, 28-23, in Week 6. The Panthers were 4-1 at the time and would finish 11-5. In the playoffs, they nearly beat the Saints. This year's 3-2 squad is nearly the same in terms of personnel. On defense, the scheme is still head coach Ron Rivera's baby, with linebackers Luke Kuechly and Thomas Davis the linchpins. When Kuechly left last year's game with a concussion, the Panthers spiraled. He's healthy and with defensive tackle Kawann Short, Carolina is stout up the middle. The most significant change on offense was bringing in retired coordinator Norv Turner. He's from the Air Coryell school of offense and is known for his vertical passing game, but the Panthers have been unable to stretch the field. Former Eagles receiver Torrey Smith was brought in to give the offense an aerial threat, but he has just one catch over 20 yards. Dual-threat running back Christian McCaffrey has a more prominent role on the ground, but quarterback Cam Newton is always a threat to take off, whether on designed runs or scrambles. He leads the team with three rushing touchdowns. The Eagles have had mixed results against Newton. He appeared to get frustrated by Jim Schwartz's game plan last October and threw ill-advised interceptions. But he has the reliable Greg Olsen back at tight end and 6-foot-4 receiver Devin Funchess could be a handful for cornerbacks Ronald Darby and Jalen Mills. The Eagles are shorthanded at cornerback (Sidney Jones), safety (Corey Graham), and linebacker (Nate Gerry). One more injury could blow the whole thing up. But Carson Wentz is getting into a groove. I'm not completely sold on the offensive line's problems being behind them, but I think the quarterback will compensate for any issues there might be up front. And the Eagles have a knack for winning at home under Doug Pederson. The Eagles' Week 6 win over Carolina last season legitimized their status as contenders. The circumstances are different for a Week 7 game this season and the Panthers changed both coordinators, but I expect a similarly tough matchup. The Eagles won't have their way with the Panthers like they did the Giants last week and they continue to miss some key pieces, but they still have Carson Wentz. I've been impressed with how Wentz has seemed to improve each week, and I expect Wentz to be the difference on Sunday. The Panthers have perhaps the NFL's best linebacker combination, so Wentz must know where they are at all times — especially Luke Kuechly. Wentz will try to challenge a Panthers secondary that allowed Andy Dalton and Eli Manning to top 300 passing yards – although they held Washington to fewer than 200 passing yards last week. Don't expect the Eagles to have a featured running back, but the Corey Clement-Wendell Smallwood combination has been enough to get by in two of the Eagles' three wins. When the Eagles are on defense, their pass rush will go after an offensive line that is missing both of its top offensive tackles. The Eagles gave Manning fits last week and they'll do the same to Cam Newton, although Newton can buy time (and yards on the ground) if the pressure's on him. Christian McCaffrey has become one of the NFL's most versatile running backs and will be a focus of the Eagles' defensive game plan. The difference in last season's games was turnovers. The Eagles had three interceptions and Wentz didn't throw one. The Panthers have been good in that area until last week, when they had three turnovers. This is going to be a tough game for the Eagles, but the extended rest and the home-field advantage will help. I wouldn't feel comfortable betting on them with the points, but look for the Eagles to have a winning record on Monday morning.